Easy integration with existing equipment designs, substantial space savings and exceptional versatility are some of the many benefits, which the new panel-mounting robot controllers from ABB Robotics offer to users of industrial robots. In addition, because the new controllers are supplied in chassis form for mounting in the user’s own control panel, they make it easy to meet special requirements such as hygienic systems with stainless steel enclosures, and systems, which can withstand washdown cleaning. Providing all the functionality of the existing fully enclosed controllers, the new models are just 250mm deep. This makes them particularly easy to accommodate, while the elimination of the integral enclosures allow useful cost savings to be made. Fifth-generation products, the new controllers have been specifically designed to provide end users with simplified application planning, set up, operation and maintenance of single or multiple robot cells. Used in conjunction with the controllers, FlexPendant hand-held terminals, with touch screens and Windows-style operation, provide an intuitive yet powerful user interface. To ensure maximum versatility, ABB’s new panel-mounting robot controllers feature a modular design, with separate modules for robot control functions, axis drives and process control functions. 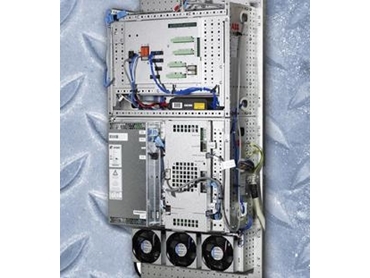 This modularity makes it easy to configure assemblies, which exactly match the requirements of the application, as well as making the systems straightforward to service and upgrade. The new units can each control up to four robots, allowing significant economies to be made in multi-robot installations. The TrueMove and QuickMove technologies used in the controllers automatically optimise motions for all robots and external axes, while MultiMove functionality allows fully synchronous operation of multiple robots, opening up application areas which would otherwise be difficult or impossible to address. According to AEW Delford Systems, the new panel mounting robot controller is a huge step forward from the old system, in terms of its design for easy integration and adaptation to various environments. AEW Delford Systems assisted ABB on the development of this product, as ita experience in this field showed there was a gap in the market. As such, AEW Delford Systems is the first customer to trial the controller and have found that it sets new standards with its modular concept, ergonomic portable interface and its ability to control multiple robots.